I get it. I think. THE POWER OF FORGETTING took me a while to work through. By Mike Byster’s design, it’ll take you a while, too. Everything starts off easily enough: here’s the brain, here’s how it works, and then—BAM! You’re then being asked to find a pattern in a group of ten-digit numbers. For “fun” Byster talks about using his brain to find out things that occur naturally, such as the longest word you can type with only the letters on the top line of keyboard. Naturally. Fun. I wanted to dismiss Byster’s ideas as being over-the-top. But then things started happening. No, I couldn’t complete half of his exercises, but of those I did complete, they must have done something. I feel like I’m remembering more. I feel like I see more. He talks of the brain’s elasticity, so between exercising it and relaxing it, I’m getting somewhere. Hopefully in the right direction. So, yes. I can see what folks are saying about THE POWER OF FORGETTING. Byster is in a league outside of the norm. This book will not turn you into a junior Byster. However, if you follow his steps and put genuine work into the lessons, something will happen, both in memory and mental efficiency. Part of me though wonders how much of this comes from the power of noticing and being present (which happens to be part of the title of a book I’ll be reviewing in a couple of months). Here’s the real thing: does Byster leave the common folks behind? Mostly, no. I would have liked simpler warm-up exercises (not sure if that goes against the Byster religion), but more so I would have liked footnotes. References. Resources. Byster rattles off info that sounds familiar to my other readings, but there aren’t many go-tos. The reader won’t know where he’s coming from; what well he’s drawing from. In the end, you’ll see improvement. 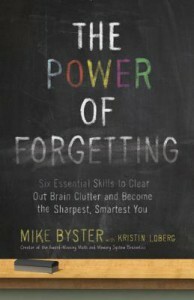 Maybe the title isn’t accurate(I’m noticing and remembering more versus forgetting more—blocking out distractions; focusing). Maybe he takes off and goes into regions we can’t follow. But if you put in the work, it’ll still pay off. Thanks to Harmony, Crown, and Random House for a review copy of this book. It’ll definitely be one that I’ll go back to: keeping that mental saw sharpened.